Enjoy an exquisite afternoon tea at the Signet Library, Colonnades, in the heart of Edinburgh’s beautiful Old Town. Step into an oasis of calm in Edinburgh’s most stylish and newest tea salon. Following a painstaking refurbishment of the Signet Library’s lower library which has seen great attention to detail with intricate gold leaf detailing towering, classical pillars, a handwoven carpet and bespoke silver teapots this gorgeous afternoon tea venue has been renamed the Colonnades. Afternoon tea is a delight to both the eyes and the tastebuds and is beautifully presented on silver, three tiered cake stands. Bite size finger sandwiches and a generous selection of delicious savouries followed by mouthwatering cakes, pastries and miniature freshly made scones will satisfy your appetite despite their dainty size. The menu will be changed each month by Pastry Chef, Matthew Oates, to take advantage of locally sourced seasonal produce. A selection of divine teas and fresh coffee are the perfect partners for your afternoon tea and a glass of champagne or gin cocktail, will be a gorgeous treat for a special occasion. This Autumn the Signet Library afternoon tea now offers a specially created ‘Signet Gin’ which has been vapour infused with Ginger Chai and Rooibos Tea, along with the delicious Edinburgh Gin blend of juniper, milk thistle, coriander and orange zest. Read our review of afternoon tea at the Signet Library’s Colonnades, watch the video and discover the magic of this very fine dining experience. Advance booking is always recommended to secure your date simply select the Book Now button and book via our partners at Bookatable. Edinburgh boasts a wealth of beautiful afternoon tea venues. 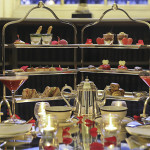 Why not browse our venues and book your afternoon tea in Edinburgh online with Girls Afternoon Tea.